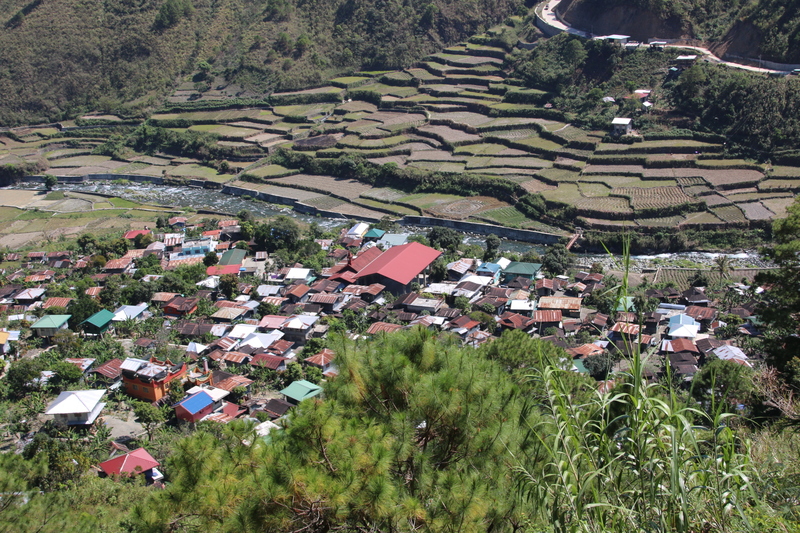 The drive through the highlands from Sagada is dramatic. This is real mountain territory with high sharp peaks and forested ridges cut apart by dry cobbled river beds wishing for the monsoon rains to top up their levels. The road follows the same meanders as the rivers although clinging right up on the sides of the ravines, peering down to the bottom as it rises through high trunks that cling into the rocky ground for dear life. There are so many giants around here. The backs of their hands positioned side by side on a table and their huge arthritic, gnarled hands and knuckles and veins are a challenge for all but the most competent of drivers. The rivers have cut deep into the mountains forming deep canyons, sharp ravines and rocky gorges. Wherever the river flattens out for a short while, terraces rise from both banks and follow the line of the tumbling waters as it stretches up the valley keeping the river company, way below us. Crawling up to the ridge top, engine grinding all the way up the gradient and then ahead there is nothing above us, no sharp ridge, no tall timber, just blue sky. So then, with a huge last desperate roar, it’s up and over and down into the neighbouring valley with a huge gasp of exhaust ￼and engine relief (did you like the way I did that?). Then down, down, approaching the crossing point at the bottom, through the corrugated iron that makes up the village or town there, over the rickety rackety bridge and then it starts all over again, grinding our way up the other side. 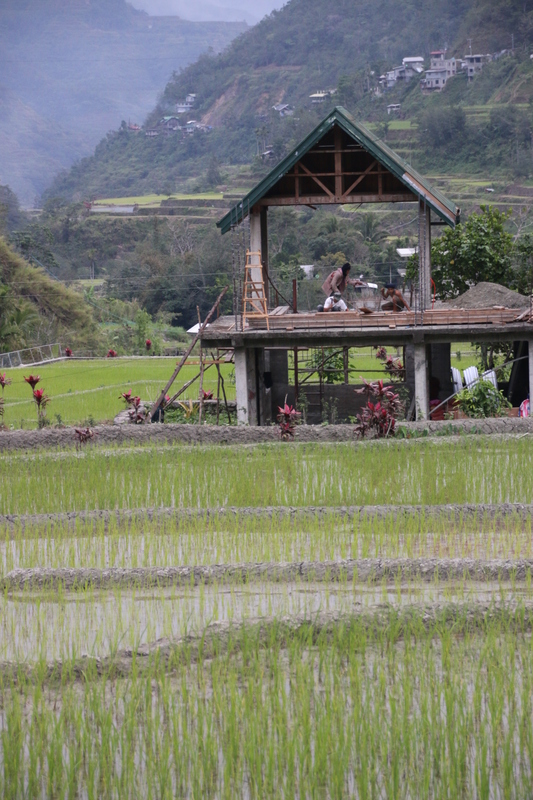 Along the road and along the rivers every space possible is terraced up to enable the locals to carry out their family farming. 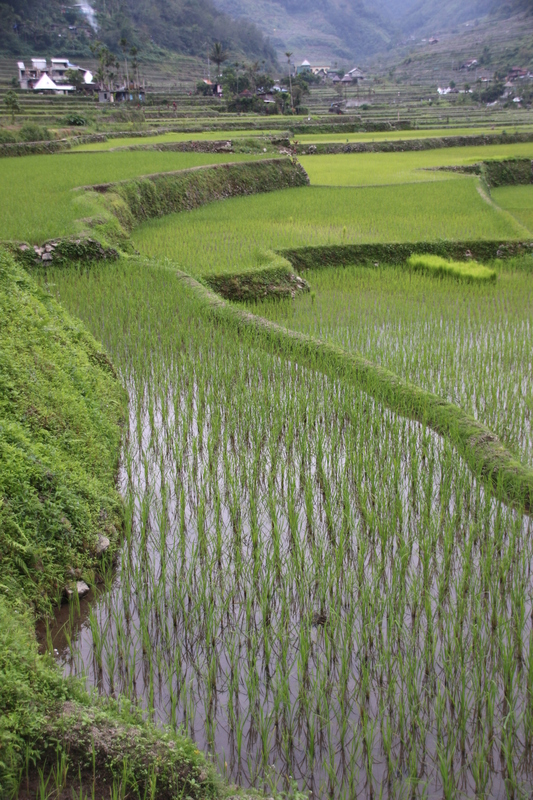 Valley sides and valley bottoms host the flattening effects of terraces where rice, in particular, and vegetables are grown in contour hugging collections of shape and size and colour and texture. If you get a chance check out a guy called Masferre. 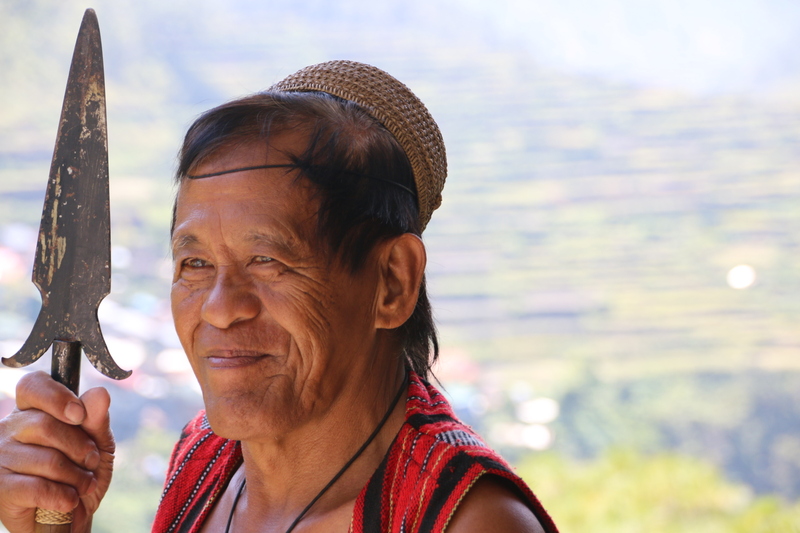 He was a Spanish Filipino photographer who took some wonderful images of tribesmen and village life in the Bontoc of region. Truely stunning. I think I have a fair bit to go. 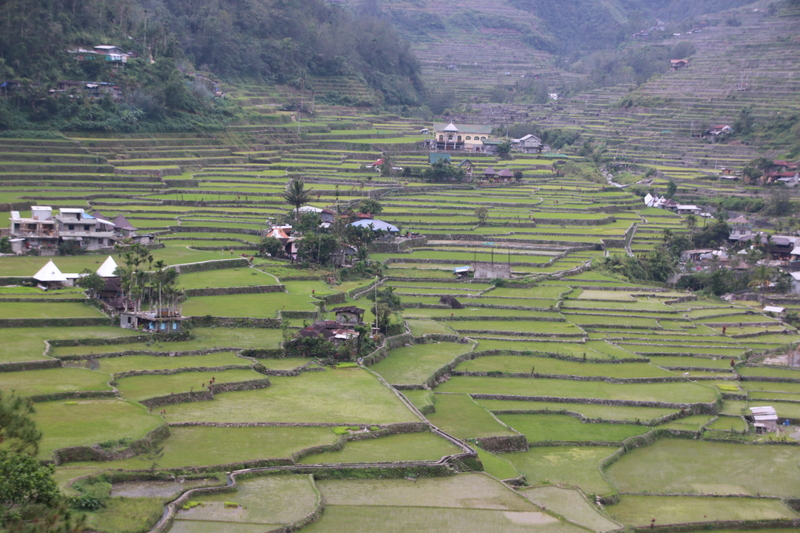 The Hapao Rice Terraces, just outside the town of Banue, are the main man when it comes to rice terraces. 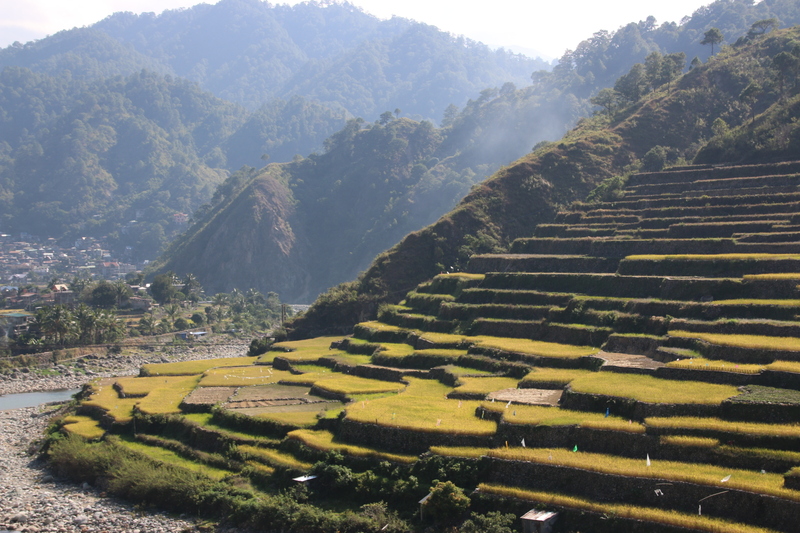 They have been here for over 2000 years and were the prototype for all terraces in the Philippines. Some are created with mud walls, which can collapse after heavy rain, and others, the stronger ones, with stones and boulders. 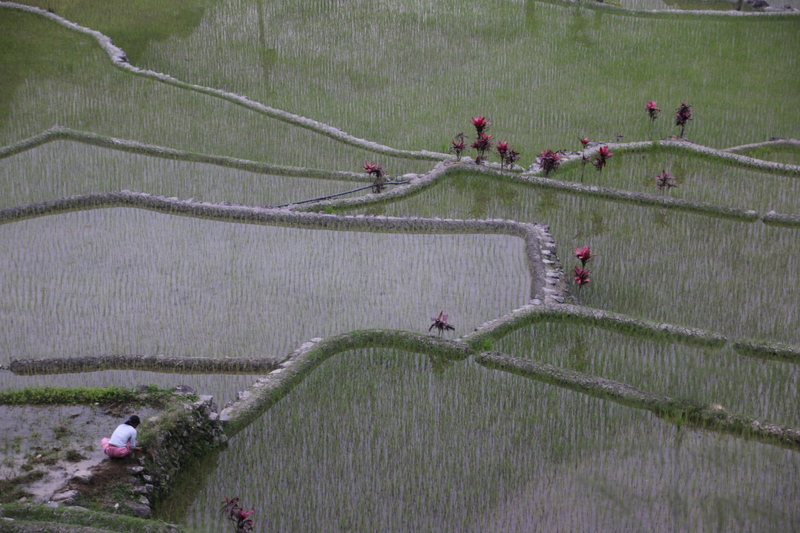 All are irrigated efficiently and have clear water trickling through or beside them in narrow channels with simple weirs to control the flow.